An epic fold-out timeline of Earth’s history in a mahoosive quiz and picture puzzle fest. The greatest spotting challenge of all time. OK: it’s ONE book of all the history EVER. How do you get all that info into a book the size of a desk diary? You get creative! So… instead of pages, this book has a really looooong fold-out timeline. 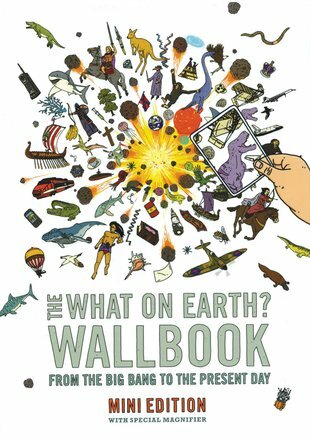 With over 1000 tiny pictures and captions telling the whole story of Earth. It’s pretty small, so instead of straining your eyes, use the cool magnifier included. Plus: on the reverse is a 100-question quiz. But where are the answers? Well, they’re hidden somewhere in the timeline! Facts, fun and a chance to show off your superior brain.